Hill later traversed the Parkway on a solo bike in half the time sans siblings, but for him and so many other cyclists, riding the Parkway isn’t about speed. It’s about the experience, the accomplishment. It’s about setting one week of your life aside to do nothing but pedal, eat, and sleep. Backpackers have the Appalachian Trail for this sort of life-changing experience, but bicyclists have the Blue Ridge Parkway—a 469-mile ridgeline highway that follows the crest of the Southern Appalachians from Shenandoah National Park to Great Smoky Mountains National Park. It is arguably the most iconic road in the United States, dubbed “America’s Favorite Drive,” and has the honor of being the most visited national park unit in the country (15 million visitors a year). 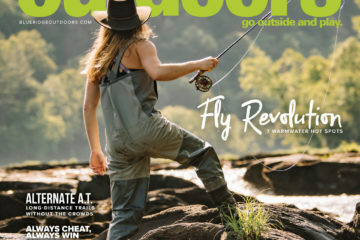 Most of those visitors are in cars–the road was initiated in the ‘30s to tap into America’s burgeoning car culture—but every year a few hardy individuals pedal the entire Blue Ridge Parkway on a bicycle. To embark on a thru-ride is to submit to a week of long climbs, fast descents and endless views, all of which is laid out before your front tire on a manicured ridgeline road. 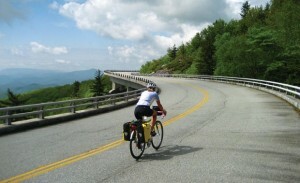 Cyclists typically knock out the Blue Ridge Parkway in five to 10 days. According to the Ultra Marathon Cycling Association, the end-to-end Parkway record belongs to Chris Boone, who rode south to north in 29 hours, 36 minutes. You’re going to want to travel a little slower. Realistically, aim for 50 to 60 miles a day, with at least one rest day in the middle. Most cyclists settle in at a 10 miles-per-hour pace, which will put you on the bike for roughly six hours a day. Overall, you’re looking at a 10-day trip. The Parkway is full of expansive views, cultural waypoints, and natural wonders. Click here to view a map of the highlights. There are very few flat stretches of the Blue Ridge Parkway. As a rule, if you’re on this ridgetop highway, you’re either climbing or descending. 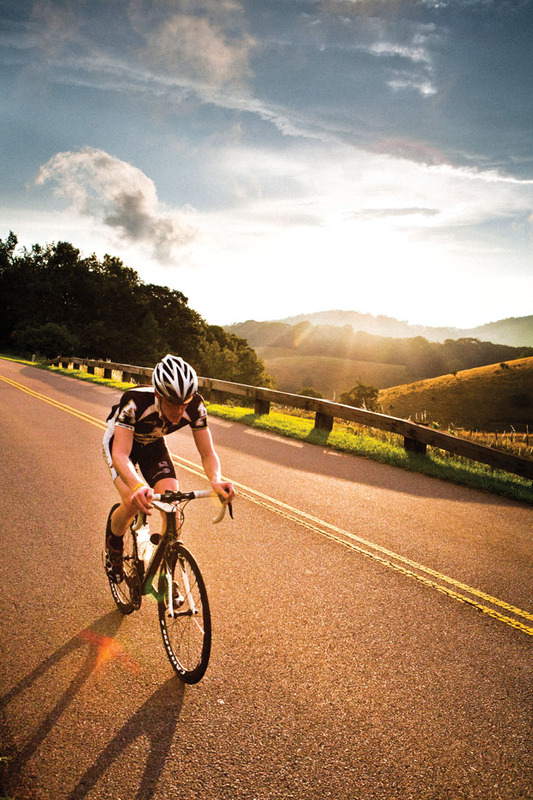 Though the climbs can be long, the road never exceeds a grade of eight percent, so they’re never too steep to tackle. 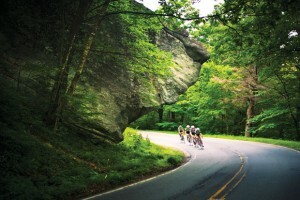 Tip: Keep an eye out for the Parkway’s two most infamous climbs. The longest single climb is in Virginia, when the Parkway stretches from its lowest point, 650 feet at the James River, to its highest point in Virginia, 3,950 feet, at Apple Orchard. 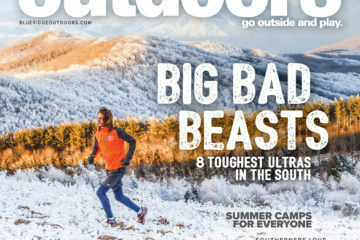 You’ll gain 3,300 feet in 13 miles. 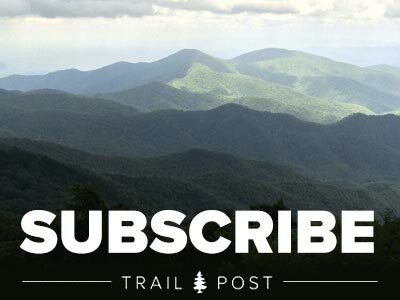 You’ll find the steepest climb in North Carolina, as you work your way up to the visitor center for Waterrock Knob, which sits at 5,820 feet. To reach this lofty peak, you’ll climb 2,500 vertical feet in five miles. The Parkway is easier to plan logistically than some other tours. It’s just one road, so you don’t have to worry about picking a route. After that, you just have to figure out where the food is and where you’re going to sleep at night. There are four lodges with restaurants located on the Blue Ridge Parkway. Their locations and clean digs make them must-stops for cyclists, but the lodges are too far apart for most cyclists to rely on them as their only source of shelter. Tip: Camping simplifies things. A network of campgrounds is situated on or near the Parkway for its entire length. If you’re willing to camp for at least half of your nights, you can avoid dropping off the Parkway each night for lodging. Camping gear adds significant weight to your touring rig. Whether you camp or stay in hotels in nearby towns, plan early and be realistic about the mileage you’ll be adding to the beginning and end of each day by seeking more comfortable digs. Peaks of Otter Lodge (MP 86) The only year-round lodging on the parkway, Peaks of Otter has dining, trails that climb to ridiculously good views, and a lake. 800-542-5927. Pisgah Inn (MP 408.6) South of Asheville, N.C., this ridgetop inn sits at 5,000 feet, with broad views from its balcony. 828-235-8228. THE BIKE Ideally, you’ll pedal a rugged but light bicycle designed for touring with a relaxed geometry and eyelets ready for racks and panniers. But don’t get too hung up on finding the perfect bike. “I rode a used Schwinn World Tour with toe clips and wore my Saucony running shoes. I paid $100 for the bike and did 85 to 90 miles a day,” says Stephen Janes of his 1998 thru-ride. PANNIERS or TRAILER? You’ve got two options for carrying your gear and food if you’re doing a self-supported Parkway tour: tow a sleek trailer off the back of the bike, or strap racks and panniers to the frame. Jon Livengood, Parkway thru-cyclist, veteran bike tourist, and co-author of the Mini Adventure Road Cycling guidebook series weighs the pros and cons of each system. Trailer: I did my Parkway ride with a trailer. The plus side is you can carry more gear and more food, which could be handy if things go wrong when you’re on the Parkway. Rack and panniers: Now, I tour with panniers. You’re more limited in what you can carry, but the bike handles much better than when you’re towing a trailer. The 105-mile Skyline Drive runs through Shenandoah National Park, sticking off the northern end of the Blue Ridge Parkway. Some cyclists tack on Skyline as part of their thru-ride, but it’s a legitimate tour in its own right, and can actually serve as a primer for cyclists not ready to take on a 470-mile multi-day journey. The climbing can be just as daunting as on the Parkway, but wayside restaurants, rest stations, and lodges are placed at easy-to-knock- off 25-mile increments, so the only thing you’ll have to worry about is riding your bike. Better yet, the scenery is nonstop, with overlooks every few miles. 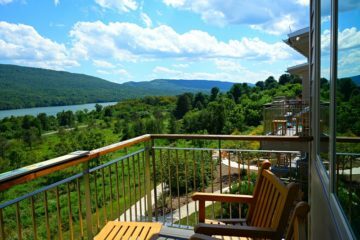 Give yourself two days to tackle the road, with an overnight at either Skyland or Big Meadows Lodge, and you’ve got yourself a picture-perfect cycling tour built for first-timers. nps.gov/shen. Don’t want to knock out the whole 469 miles? Check out these two choice sections, perfect for a day ride. This section includes the longest climb on the Parkway, but since it’s an out and back, that means you enjoy the longest downhill when you’re headed back. In between the 3,500-foot ascent and 3,500-foot descent, you cross the James (MP 64), get stellar views from a nearly 4,000-foot mountain (Apple Orchard, MP 76.5), and have the option to check out a 200-foot waterfall (Apple Orchard Falls, MP 78.5). Your ride “up” the Parkway will end at Peaks of Otter (MP 85.9), renowned for its majestic setting. 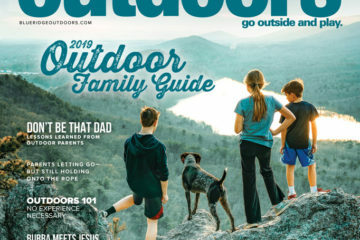 Save some energy to hike the Sharp Top Mountain Trail, which leads to mountaintop bluffs and boulders with a 360-degree view. Fuel up at the lodge’s restaurant, then see how fast you can bomb the Parkway back down to your car. You’re climbing most of the way to FR 816, which leads to the Art Loeb Trail and Black Balsam. But along the way, you’ll have a chance to check out Yellowstone Prong Falls at Graveyard Fields (MP 418.8), see Looking Glass Rock in the distance (MP 417), and hike the quick trail to the top of Black Balsam (MP 420), a rocky Southern Sixer with one of the best views in the Southern Appalachians. 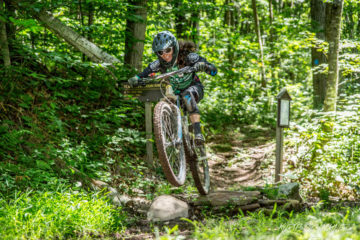 After snapping some pictures at the peak, hop on your bike and enjoy the long downhill back to Pisgah Inn (MP 408.7) for a bite to eat. 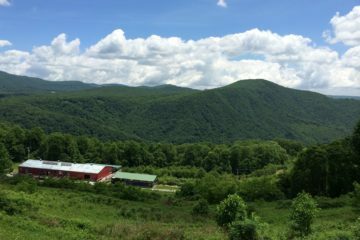 Paul Wood is the owner and operator of Black Bear Adventures, the leader in guided end-to-end rides of the Blue Ridge Parkway. Black Bear guides half a dozen trips each year on the Parkway, and Wood guides most of the trips himself. It’s possible that this veteran cyclist has ridden the Parkway end-to-end more than any other biker in the country. How did you become the go-to Parkway bike guide? Wood: I was a mechanical engineer, working for an apparel company in the 80s and 90s, chasing cheap labor. 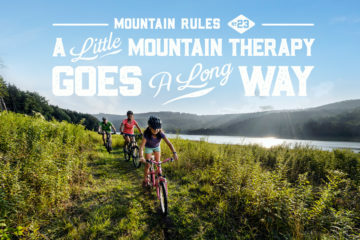 I finally quit, spent some time in a cabin in the mountains and saw an ad from a mountain biker looking to start guided trips. I offered to help. That was nine years ago. How many times have you ridden the Parkway from end to end? Wood: I participate in each tour. We average five to six full traverses a year with lots of other shorter tours that use the southern portion of the Parkway. I’ve led 35 full traverses in nine years. The experience is so remarkable, 30 percent of our clients are repeat cyclists. One guy has done it seven years in a row with me. What makes the Parkway ideal for cyclists? Wood: The beauty of the Parkway is that it’s a linear national park. It’s a driving park, but go during the week, on an isolated stretch, it feels like a bike path. Have you ever had a client show up for a traverse on a beach cruiser? Wood: I did have one guy show up on a mountain bike. He wouldn’t even consider putting slicks on it. And a couple of people have wanted to do it on tandems. I try to talk them out of it, or to bring their single bikes too. There’s going to come a time during the week when you’re not going to want to ride the tandem. 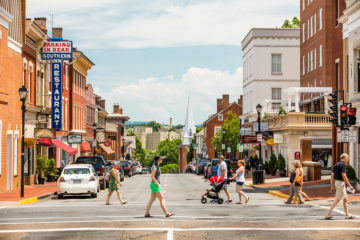 What’s the best town on the parkway? Wood: Asheville. That’s the jewel of the Parkway. It’s such a vibrant city. The cycling around the city is world class, and the food is amazing. Do you have a favorite mile? Wood: The Parkway is like a crescendo. It just builds and builds. It’s all nice, but the bigger, more dramatic mountains are my favorites. I like the stretch coming out of Blowing Rock, crossing the Lynn Cove Viaduct–that’s pretty spectacular. But if I’m picking a favorite, it’s the stretch between Black Balsam and Richland Balsam. 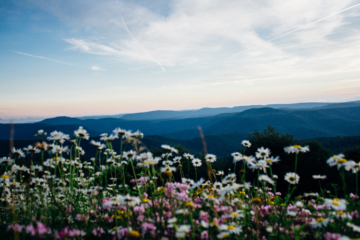 You’re surrounded by Pisgah National Forest. It’s remote and scenic, and we typically won’t see anyone. It’s just us riding our bikes. Best advice for would-be Parkway cyclists? Wood: Be prepared to be in the saddle for four to seven hours a day, several days in a row, and riding a consistent pace of 12 miles per hour. It’s up and down all the time. There are no flats. You climb for two hours and descend for five minutes, then do that again, all day long. It’s hard to get lost on the parkway. Why use a guide? Wood: Because it’s your chance to be a pro. Ride to the rest stop, hand over your bike to a mechanic, sit in the chair we set out for you, and eat the lunch we prepared. You get to relinquish all responsibility, all decision making, and just enjoy the vacation. You could keep your head down and pedal all 469 miles without diverting from the Parkway, and you’d probably have a blast. Or, you could occasionally drop off the Parkway and hit some sites worthy of a diversion. 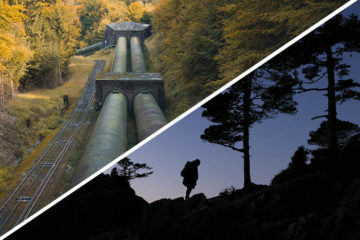 Here are four side trips worth your time and energy. The 24-acre Sherando Lake sits inside George Washington National Forest, flanked by steep mountains, and offers a cold-water respite from the heat on the Parkway. Take Va. 814 west for 4.5 miles. Drop off the Parkway on US 276 for several miles to Sliding Rock, a 60-foot waterfall over bedrock that forms a perfect waterslide. It’s crowded on weekends, but it’s worth it. 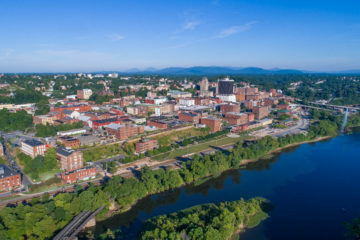 Scoot over to Asheville via US 25 and hit half a dozen breweries within the city’s downtown area. There’s a reason why Asheville has been dubbed Beer City, USA three years running.